After each service, the service indicator must be reset to zero. 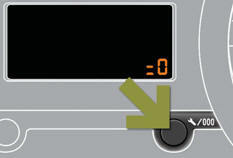 when the display indicates "=0" , release the button; the spanner disappears. Following this operation, if you wish to disconnect the battery, lock the vehicle and wait at least fi ve minutes for the zero reset to be taken into account. You can access the service information at any time. Press the trip distance recorder zero reset button. The service information is displayed for a few seconds, then disappears.